Today We are sharing you the Strategy about how to Attempt the English Section in Bank Exam and how to grab maximum marks in less time. If you follow the below steps I assure you that you can easily score 15-25 marks based on you practice with these tips. I. Read the original sentence carefully and try to spot grammatical errors by identifying whether something “sounds” wrong. II. Always look at every choice. III. Even when the original sentence seems fine, pay attention to the grammar that it tests and look through the choices systematically to see if any provides a better option. IV. As you locate each error, eliminate all of the choices that contain that error. V. Do not read each answer choice back into the sentence individually; that wastes time and invites inaccuracy. VI. Instead, identify the differences among the choices and eliminate those that offer less effective or grammatically incorrect alternatives. I.Read the whole sentence to get the message and go with the flow. III. Think of the logic behind the option, you can also go with Odd one out strategy. IV. Accuracy is the key, so better be sure before marking your answer. V. Most of the Time if you will try to arrange the sentence on Subject + Verb + Agreement rule you will find your error. I. In order to solve questions on spotting errors, the first step you should take is to read the complete sentence carefully. In most of the cases, you will be able to detect the error in the first go itself. II. While reading the entire sentence, you must carefully check the subject-verb agreement. III. If you can still not detect the error or you are still unsure of the correct answer, then you must read each individual part of the sentence and closely examine which part consists of an error. II. Find out the Independent sentence, it’ll give you the lead like if the passage is talking about some person then the line which contains the detail about that person will be your first sentence and like that at the place of person it can be anything try to find out that key on whom the whole passage is based on. IV. Identify the pair while looking for some cause, effect, problem then its solution. I. Once read the Whole Passage without reaching the Options and try to fill with your option which you think should be the answer and then go through the options and find your words synonyms if there then your answer is right. 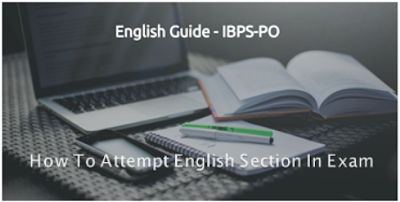 This is the best practice by which you can get maximum marks in this section. II.Another way is through odd man out by this method you can solve 5-6 question first read the whole passage and get your understanding like the subject of passage and now from options you can easily eliminate two option. III.Always Read the passage and try to go with the flow of the sentence to get the message behind the passage. IV. If there is any doubt it’s better to skip that question rather than attempting it. V. Practice is the only key to solve cloze test with maximum accuracy. I. It is expected that RC passage will be based on Socio-economic issue. So to handle this either one must regularly read editorial of newspapers or you have done lots of practice with mock test paper. II. Don’t spend much time on single question. III. Skip those questions which ask you to find out the correct or incorrect from the passage or have multiple options to look for. IV. Sometimes Keeping time factor in mind, it’s better to attempt only Antonyms and Synonyms. 1) Always start answering with small questions like spotting errors, double fillers, sentence improvement, Para Jumble etc. and keep the comprehension for last as its time consuming but you have good reading skill then attempt passage first because it has 10-15 marks and by solving all you can grab maximum marks. 2) No one can answer all the questions in English with hundred percent accuracy so attempt only those questions which you are sure about instead of making wild guesses. 3) While attempting fillers with two blank, there will be one blank which will be easy to identify and you can relate the second one accordingly. 4) Sometimes we face problem with sentence rearrangement also, so it’s better to identify the first and last sentence first and then arrange the remaining if you can. 5) For comprehension, first read whole passage once in about one min to only get the idea about the subject and mark some with paragraph number then go through the passage and questions simultaneously. This will help you in answering the question quickly without wasting time because you already know that your answer is in which paragraph. Stay updated with us for more study materials for all competitive exams. 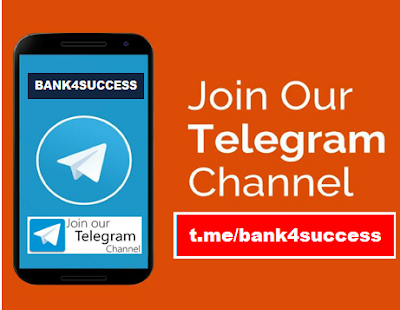 bank4success is one of the fastest Growing Educational Channel for Banking and Insurance Exam.If Our Services and Posts has helped you in your Preparation then Please Support us to Grow and help us to connect with Your Friends and their friends also. 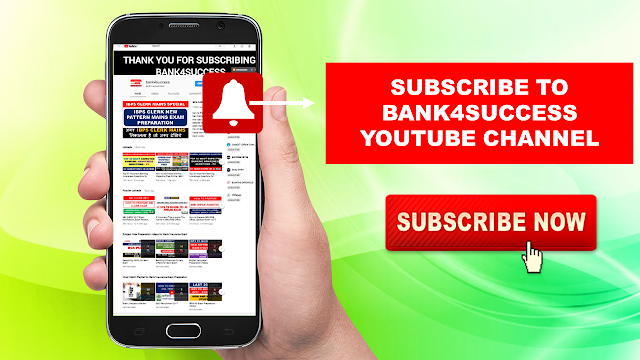 Like, Share & Subscribe Our Various Social Media Channel.